The Patriots weren't on vacation in Mexico but it sure seemed as easy as staying in a beach side resort with a fruity beverage. 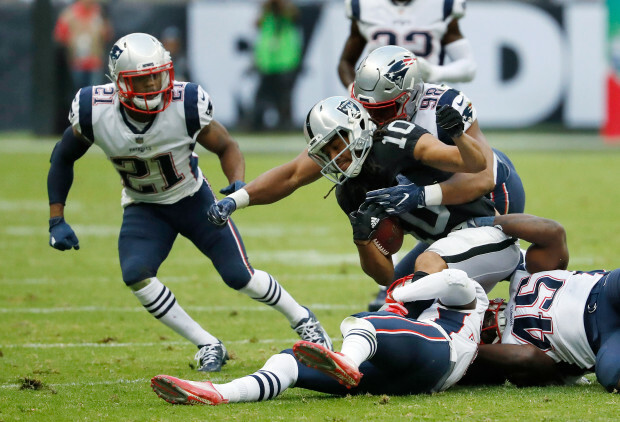 The Oakland Raiders offered little resistance in the 33-8 beatdown and now the Patriots are streaking with an 8-2 record, tied for the best record in the AFC. There were numerous positives to take from this game, but everyone knows defense wins championships, so lets focus on that side of the ball, specifically the secondary. The secondary was the object of vicious attacks from Patriots Nation after the 2-2 start. They were admittedly awful, letting receivers run free on multiple plays per game. Allowing 30 points per game was not going to cut it and the whole defense knew they needed to improve. It was boiled down to communication issues, and the secondary promised that more practice time would iron out the problems. No one in the locker room was worried despite the freak out from everyone living in New England. We had all seen this story before; epic Tom Brady season derailed by a porous defense. This defense is set on being the strength of this team by the end of the year. Derek Carr passed for a measly 237 yards with 1 touchdown and 1 interception, with most of those yards coming with the game well out of reach. The run defense struggled in this game so it was up to the secondary to make plays and they stepped up and caused two costly turnovers. The turnovers were the result of blanketing coverage by Jon Jones on the Duron Harmon pick and excellent pursuit to the ball on the fumble recovery by Patrick Chung. The Patriots run defense allowed 109 yards on 21 carries which isn't going to cut it once January rolls around. Additionally, they pressured Carr very rarely, ending with only one sack. That formula puts a lot of pressure on the back end to play stiff man-to-man coverage, and make sound tackles when they do let up a catch. The secondary executed that plan to perfection yesterday against a talented Raiders offensive unit. Lets remember that they run out Amari Cooper, Michael Crabtree, Jared Cook, Seth Roberts and backs Marshawn Lynch and Jalen Richard. That's crazy talent and the Patriots employed tons of man to man schemes against these receivers and the corners made plays. When the Raiders completed passes, the defense swarmed to the ball and made quick tackles and limited yards after the catch. The Raiders had multiple drops and Carr was trying to be a perfectionist on some throws, all because of the bump and run coverage the Patriots secondary employed. It's a simple formula in theory, but it has proven to be successful during this 6 game winning streak. The utility in this scheme is that it forces the offensive weapons to shake ball hawking man coverage, and often make a catch in traffic. Malcolm Butler, Stephon Gilmore, Jonathan Jones and Patrick Chung are all proven in man coverage. That allows Bill Belichick and Matt Patricia freedom to double top weapons with the safeties, send linebackers on blitzes and force turnovers. With a run defense that's inconsistent, it's piece of mind for Belichick knowing he can play single wide man coverage and commit more players to stopping the run. If this defense can make an offense one dimensional, like the Raiders were in the second half, they can be aggressive on their play calling and be disruptive. This secondary has done it against some top talent such as the Falcons, Chargers, and Bucs. It's time to finally recognize that this defense may let up some yards, but they will be stingy in the red zone and the corners will battle every play. The secondary is the key to this defense and the last 6 weeks has shown what kind of potential this whole defense has. Yet again, Belichick's teams keep improving through November and truly show us what type of team they can be come playoff time. The secondary deserves props for taking the criticism, and channeling it into stellar play. This defense should no longer worry fans and of course, there is still always room for improvement. Follow me on twitter @jakescearbo to talk more about the ceiling of this Patriots defense! Check out my website at jakescearbo.com to read more Patriots articles by me!